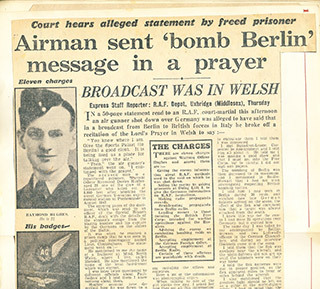 Giving the enemy information about RAF methods used in the raid on which he was shot down. 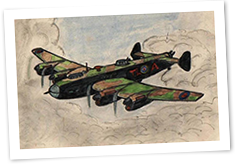 Aiding the enemy by asking prisoners at Dulag Luft I to give the Germans information on RAF formations. Making radio propaganda records. Broadcasting propaganda from Berlin radio. 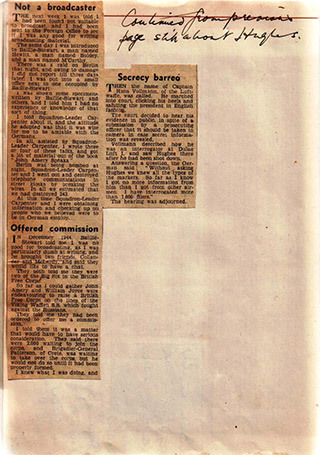 Lending money to those forming the British Free Corp intended for warlike operations against the Russians. Advising the enemy on combating bombing raids on Berlin. Accepting employment at the German Foreign Office. Accepting employment at Berlin Radio. Certain of these offences are punishable with death. “You know where I am. Give the Sports Palast (in Berlin) a good clout. 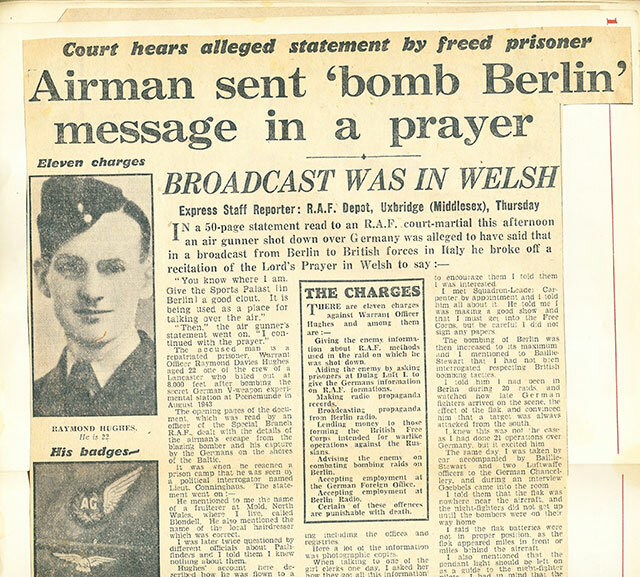 It is being used as a place for talking over the air.” The accused man is a repatriated prisoner, Warrant Office Raymond Davies Hughes aged 22 one of the crew of a Lancaster who baled out at 8,000 feet after bombing the secret German V weapon experimental station at Peenemunde in August 1943. 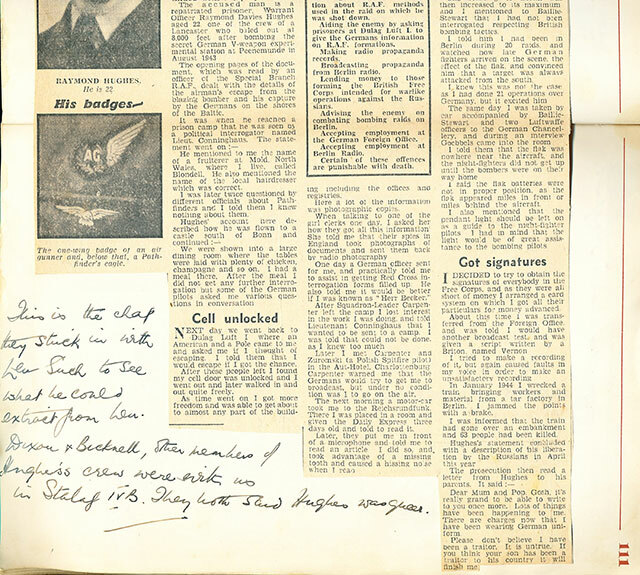 The opening pages of the document which was read by an officer of the Special Branch RAF dealt with the details of the airman’s escape from the blazing bomber and his capture by the Germans on the shores of the Baltic. It was when he reached a prison camp that he was seen by a political interrogator named Lieut Conninghaus. The statement went on: He mentioned to me the name of a fruiterer at Mold, North Wales where I live, called Blondell. He also mentioned the name of the local hairdresser which was correct. I was later twice questioned by different officials about Pathfinders and I told them I knew nothing about them. Hughes’ account here described how he was flown to a castle south of Bonn and continued: We were shown into a large dining room where the tables were laid with plenty of chicken., champagne and so on. I had a meal there. After the meal I did not get any further interrogation but some of the German pilots asked me various questions in conversation. Next day we went back to Dulag Luft I where an American and a Pole came to me and asked me if I thought of escaping. I told them that I would escape if I got the chance. After these people left I found my cell door was unlocked and I went out and later walked in and out quite freely. As time went on I got more freedom and was able to get about to almost any part of the building including the offices and registries. Here a lot of the information was photographic copies. When talking to one of the girl clerks one day. I asked her how they got all this information. She told me that their spies in England took photographs of documents and sent them back by radio photography. One day a German officer sent for me, and practically told me to assist in getting Red Cross interrogation forms filled up. He also told me it would be better if I was known as “Herr Becker”. Berlin was being bombed at night. Squadron-Leader Carpenter and I went out and destroyed telephone communications in street kiosks by breaking the wires. In all we estimated that we had destroyed 243. 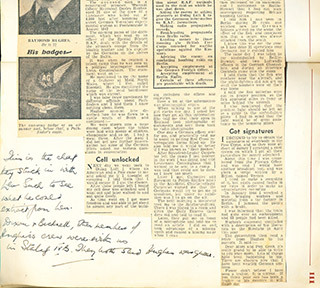 At this time Squadron-Leader Carpenter and I were obtaining information and checking up on people who we believed were to be in German employ. In December 1944, Baillie-Stewart told me I was no good for broadcasting, as I was particularly dumb at writing, and he brought two friends, Collander and McLardy, and said they would like to have a chat. They both told me they were two of the big six in the British Free Corps. So far as I could gather John Amery and William Joyce were endeavouring to raise a British Free Corps on the lines of the Viking Waffen SS which fought against the Russians. They told me they had been ordered to offer me a commission. I told them it was a matter that would have to have serious consideration. They said there were 2000 waiting to join the corps, and Brigadier-General Patterson of Crete was waiting to take over the corps but he would not do so until it had been properly formed. I knew what I was doing, and…to encourage them I told them I was interested. I met Squadron-Leader Carpenter by appointment and I told him all about it. He told me I was making a good show and that I must get into the Free Corps, but be careful I did not sign any papers. The bombing of Berlin was then increased to its maximum and I mentioned to Baillie-Stewart that I had not been interrogated respecting British bombing tactics. I told him I had been in Berlin during 20 raids and watched how late German fighters arrived on the scene, the effect of the flak, and convinced him that a target was always attacked from the south. I knew this was not the case as I had done 21 operations over Germany, but it excited him. The same day I was taken by car accompanied by Baillie-Stewart and two Luftwaffe officers to the German Chancellery, and during an interview Goebbels came into the room. I told them that the flak was nowhere near the aircraft, and the night fighters did not get up until the bombers were on their way home. I said the flak batteries were not in proper position, as the flak appeared miles in front or miles behind the aircraft. I also mentioned that the pendant light should be left on as a guide to the night-fighter pilots. I had in mind that the light would be of great assistance to the bombing pilots. I decided to try to obtain the signatures of everybody in the Free Corps, and as they were all short of money I arranged a card system on which got all their particulars for money advanced. 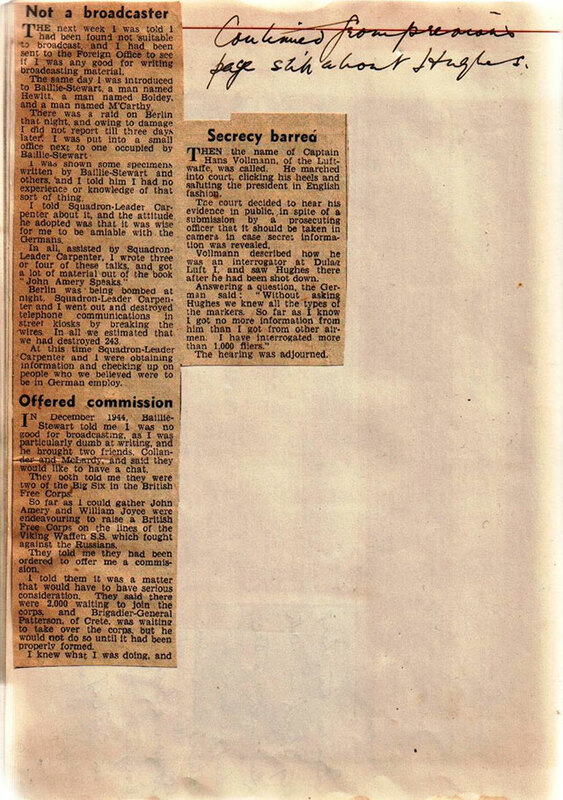 About this time I was transferred from the Foreign Office and was told I would have another broadcast test and was given a script written by a Briton named Vernon. I tried to make a recording of it but again caused faults in my voice in order to make an unsatisfactory recording. Gosh, it’s really grand to be able to write to you once more. Lots of things have been happening to me. There are charges now that I have been wearing German uniform. Please don’t believe I have been a traitor. It is untrue. If you think your son has been a traitor to his country it will finish me.